If you feel the bloat and guilt before the holidays have officially hit, I've got a plan to help you stay on track! Here are some of my tips to help you stay fit during the holidays! Family gatherings, gift shopping, travel..so many things vying for your already stretched-too-thin time.This is where the discipline we've worked so hard to grow gets tested. We become tempted to fall away from our healthy lifestyle by skimping on sleep, eating in a way we normally wouldn't, or skipping out on our regular exercise routine. I'm here to tell you, there are ways to make this work and stay on track! Let's begin with an exercise hack that won't take a lot of time, or space and can actually help your productivity at work! Exercise doesn't always have to end with you drenched in sweat, and it doesn't always have to be done all at once. You can do 10 minutes here and ten minutes there, or sometimes even less! One of the added bonuses of even brief bursts of exercise is that it also improves your brain function. When we find ourselves sitting for hours at a time, our thinking can tend to become lethargic. 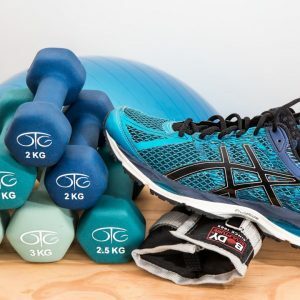 Breaking up your 8-hour day with small bursts of exercise saves you time, helps you get your workout in during extra busy seasons, and can benefit work productivity by giving your brain an energy boost! If feasible, keep a yoga mat and hand weights at your office. Each day, choose an exercise (or mix it up and choose a few different ones), and set your phone alarm to go off every hour to remind you to get up and move for 1 to 2 minutes or more if you have the time to spare. The list of possibilities is endless. Pick one and repeat it every hour or do different ones each time, either way - these brief exercise bursts can add up to big rewards both physically and mentally! Here's to keeping your progress and discipline up during this busy holiday season!